A craniotomy is a surgical procedure in which a piece of the skull is removed so the surgeon may access the brain beneath, for the treatment of a variety of neurological disorders. A craniotomy is a surgical procedure in which a piece of the skull is removed so the surgeon may access the brain beneath. 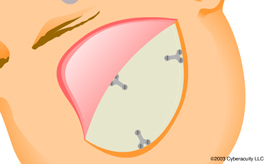 The cut-away portion – called the bone flap – may be small or large, and is typically put back in place after surgery on the brain is finished the incision closed. In addition to providing access to the brain, a craniotomy also allows a surgeon to inspect the brain for abnormalities, perform a biopsy or relieve pressure inside the skull. After your hair is shaved, you’ll be sedated under general anesthesia. After you’re asleep, your head will be secured in place with pins to a skull fixation device attached to the operating table. Based on your preoperative diagnostic imaging exams, your surgeon will make an incision in the skin and muscle over the part of the skull to be removed. The flap of skin and muscles are lifted up and pulled back to expose the skull. Using a special saw called a craniotome, your surgeon will cut between the burr holes to create a bone flap. The bone flap is removed to expose the protective membrane of the brain, called the dura. 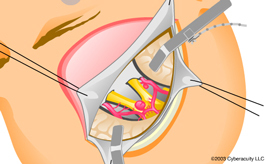 After making an incision in the dura, your surgeon folds the dura back to expose the brain, securing it with retractors. Your surgeon performs the brain surgery required. 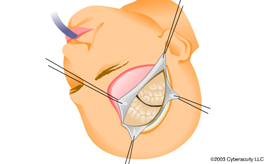 The retractors are removed and the dura closed with sutures. The bone flap is replaced and secured with plates and screws, which remain permanently to provide support. The muscles and skin are replaced and sutured; a drain may be inserted to prevent fluid retention. A soft adhesive bandage is placed over the incision. After your procedure, you’ll be taken to the recovery room, where your vital signs will be monitored as you awaken from the anesthesia. 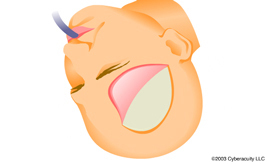 Depending on the type of surgery performed, you may be given steroid medication (to control swelling) and anticonvulsant medication (to prevent seizures). Narcotic pain medication also may be prescribed for a limited time period for pain. Your hospital stay may range from several days to several weeks, depending on the procedure and how well your recovery is progressing. Full recovery may take up to 8 weeks, depending on the underlying condition and your general health. A temperature that exceeds 101 degrees. Signs of infection at the incision site, such as redness, swelling, pain or drainage. Drowsiness, balance problems or rashes, if taking an anticonvulsant. Decreased alertness, increased drowsiness or weakness in the arms or legs. All treatment and outcome results are specific to the individual patient. Results may vary. Complications such as infection, nerve damage, blood clots, blood loss and bowel and bladder problems, along with complications associated with anesthesia, are some of the potential risks of spinal surgery. Please consult your physician for a complete list of indications, warnings, precautions, adverse effects, clinical results and other important medical information.